Skillet rosemary balsamic pork chops come together in one pan for an elevated dinner recipe that is easier to prepare than you might think. 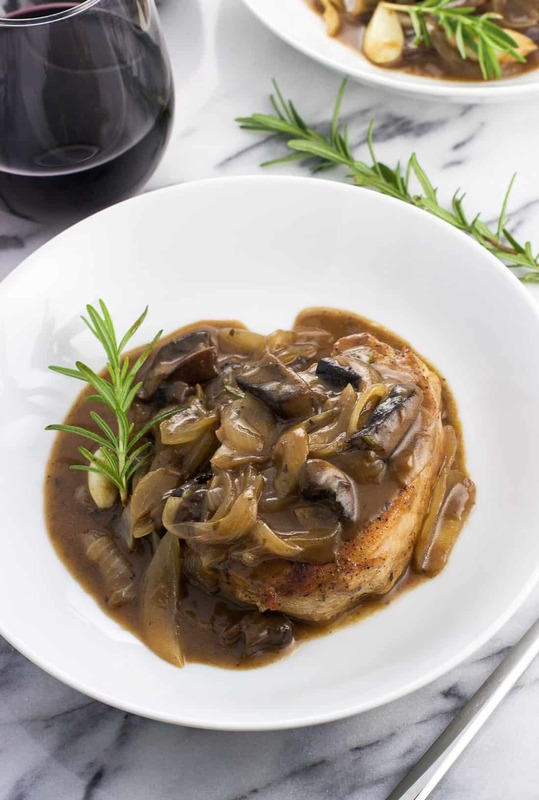 This easy pan sauce features mushrooms, onion, and whole garlic for a creamy touch flavored with rosemary and balsamic vinegar. It’s easy to think of certain foods as seasonal (hot dogs on the grill for summer, pumpkin everything for fall, etc.) but other dishes are less overt. Pork chops don’t exactly scream ‘seasonal’, you know? 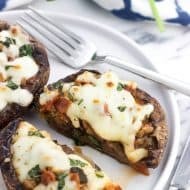 But when prepared with luxuriously sauteed onions, mushrooms, and garlic and served with a creamy rosemary balsamic pan sauce, this easy-but-elevated main dish recipe becomes a warming and cozy dinner perfect for a chilly fall night. 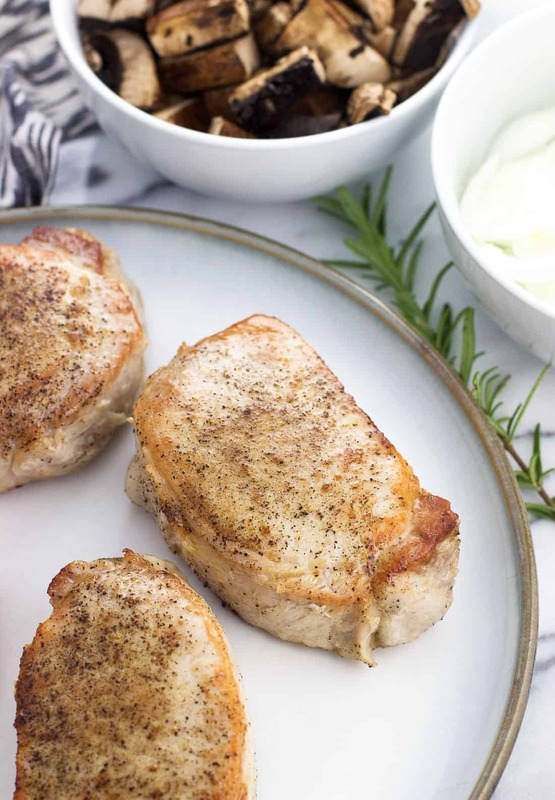 In fact, these rosemary balsamic pork chops are so versatile that they totally work as a weeknight, after-work dinner or as the main event when hosting a dinner party. Total comfort food for either occasion. This simple, yet fancy dinner just calls out for a wine pairing, and Decoy Sonoma County Merlot is my choice. 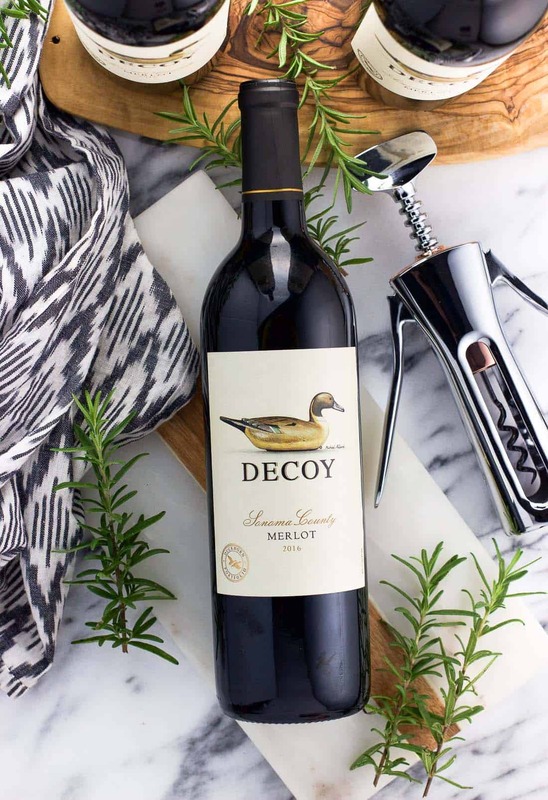 It’s a lush and balanced wine that is a joy to sip and share with friends. On the topic of wine, did you know that October is International Merlot month? Over 100 Merlot producers have joined together to celebrate the grape all month long. Whether you’re enjoying a glass at home, toasting out to eat with friends, or even attending a wine-tasting, pick a Merlot! 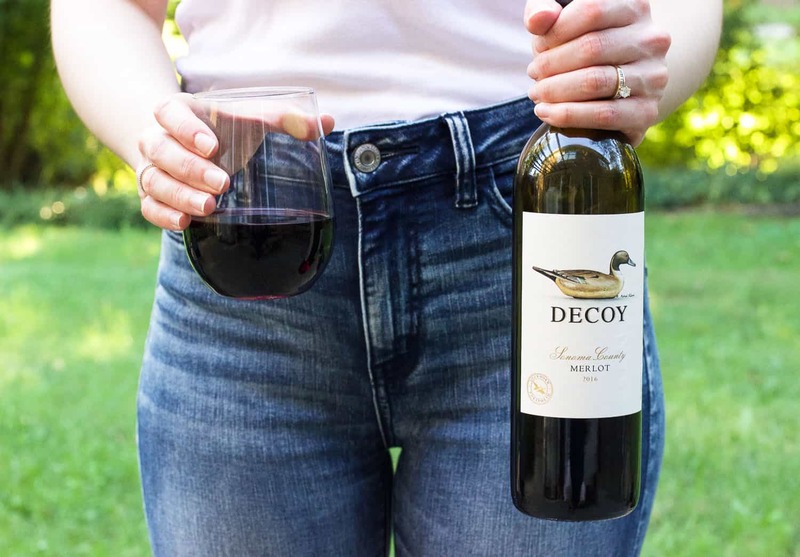 You can check out MerlotMe.com to learn more about how you can participate in International Merlot month, and use the hashtag #MerlotMe on social media to find new varieties to try, chat with other Merlot fans, and share your Merlot experience. This is a movement I can definitely get behind (uh, that’s an understatement! 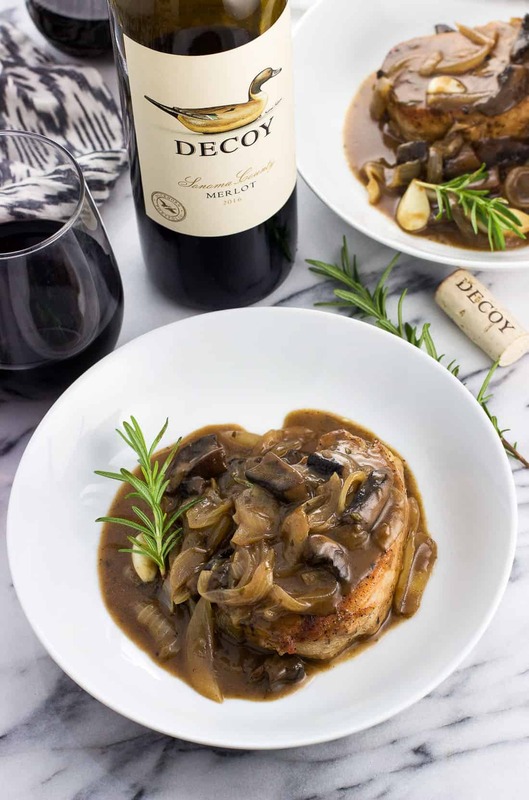 ), and the Merlot from Decoy Wines is so good for pairing with these skillet rosemary balsamic pork chops. Its layers of fruitiness and its smooth finish hold its own as a delectable and complementary match for a hearty dinner. Neither the Merlot nor the pork chops overwhelm the other, which is an important balance for a main dish wine pairing. Just enjoyable from beginning to end. This pork chop recipe is prepared all in one skillet right on the stovetop, minimizing the number of dishes you’ll have to wash afterwards. How great is that?! You’ll start by searing the pork chops. This helps amp up the flavor on the pork’s surface from all that delicious browning you see in the above photo. Those are the chops right after they have been seared for two to three minutes per side. In order to achieve the perfect sear, make sure your pan is hot hot hot. I always get antsy when it comes to checking on the bottom-side of something I’m cooking on the stove (I’ve been burned by one too many blackened grilled cheeses), but try and resist the urge to disturb the pork chops while they’re searing. They’ll do their thing just fine. Instead of dicing an onion, I cut it into strips à la the steps featured in my how to make caramelized onions post. The onions (and the mushrooms for that matter) become velvety soft and tender when cooked in butter, and I didn’t want the onions to hide in the sauce. I don’t think you will either. One of my favorite parts of this sauce is how it becomes thick and creamy – without any cream. Instead, chicken broth reduces with the help of a sprinkling of flour to provide structure and even more savory flavor. Fresh rosemary and balsamic vinegar round out the sauce in such a satisfying way. My backyard rosemary plant has picked up speed lately, and I’ve been looking for more ways to use it before the cold months come. 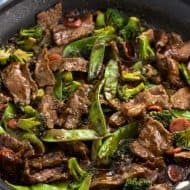 I find it adds an upscale flair to something simple like a pan sauce that makes your recipe feel fancier than the effort involved should yield. Adding the balsamic vinegar near the end of the cook time allows the tart flavor to mellow slightly, while still maintaining a bold presence. 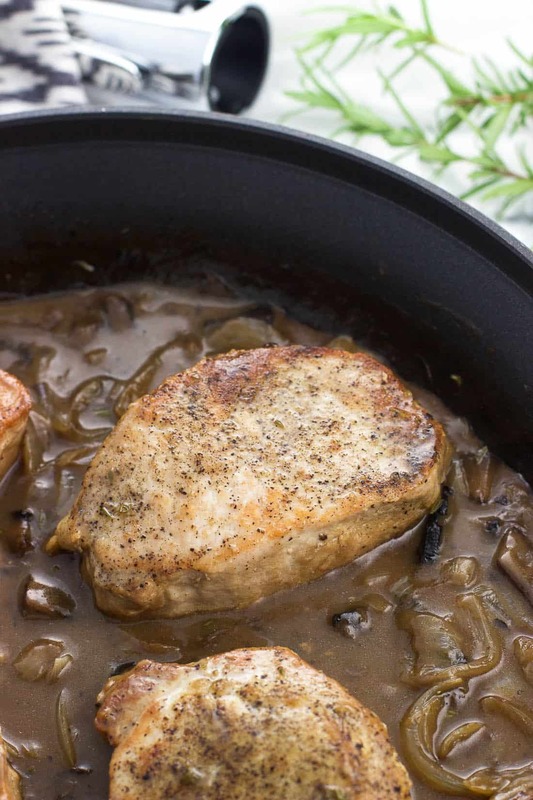 Two tablespoons did the trick on adding its signature touch to this skillet pork chops recipe. An instant-read thermometer is incredibly helpful for cooking these pork chops for just the right amount of time. You want to aim for 145°F registering in the middle of the thickest one. Related, but try and buy pork chops as similar in thickness as you can so they cook in the same time. Don’t be afraid of the garlic cloves being left whole. The flavor mellows considerably as they are sauteed and cook in the sauce. 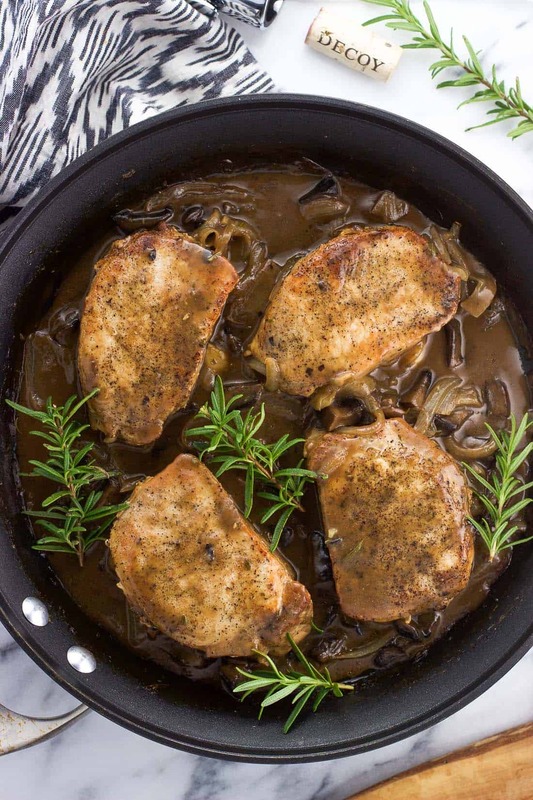 Skillet rosemary balsamic pork chops come together in one pan for an elevated dinner recipe that is easier to prepare than you might think. 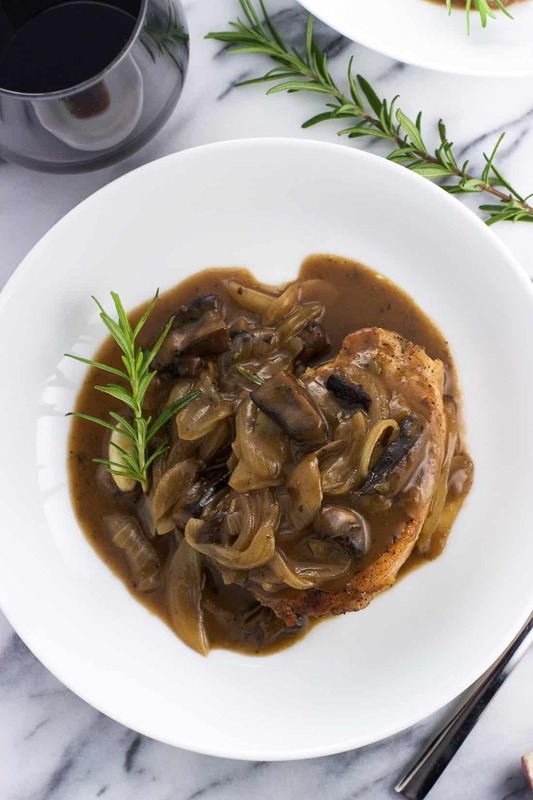 This easy pan sauce features mushrooms, onion, and whole garlic for a creamy touch flavored with rosemary and balsamic vinegar. 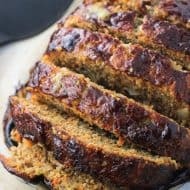 It pairs wonderfully with Merlot for fall entertaining! Season both sides of the pork chops with the salt and pepper. Add olive oil to a large pan set over medium-high heat. Once the oil is hot, add the pork chops in a single layer and cook for 2-3 minutes on each side. Once seared, remove pork chops to a plate. Reduce the heat to medium and place the pan back on the stovetop. Add the butter and swirl it around the pan as it melts. Add the sliced mushrooms, sliced onion, and whole garlic cloves to the pan. Cook, stirring periodically, for 4-5 minutes or until the onions are becoming tender and golden. Sprinkle the flour over top and stir until it is incorporated. Stir in the broth and the diced rosemary. Add the seared pork chops back to the pan in a single layer. Reduce the heat to a simmer and cover the pan. 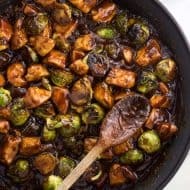 Cook for 8 minutes, then pour in the balsamic vinegar, stirring everything up. 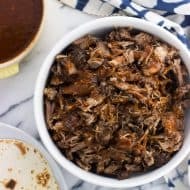 Cook for another 3-4 minutes, or until pork reaches 145°F in the center of the thickest part. Remove pork chops to a separate plate to rest. Place the pan back on the stove over medium heat and continue to cook until the sauce has thickened to your liking. Serve pork chops with sauce and garnish with fresh rosemary for serving. Using an instant-read thermometer is very helpful in assessing when your pork chops are done. You want the center of the thickest chop to reach 145°F. Since the internal temperature will rise a bit when the pork chops rest, try and be as prompt as you can when it's time to remove them from the pan to prevent them from overcooking. Adjust the cook time as needed if your pork chops are a bit thinner. The temperature will be your guide.